We know. You're busy. There's no time to be searching through folders on your computer to find that one image or file you need. That's why we offer a photo and file gallery called the Library. You can upload images, PDFs, and other file file types to quickly insert into your HoneyBook emails again and again. PLEASE NOTE: At the moment, the maximum file size for uploads is 15MB. 1. 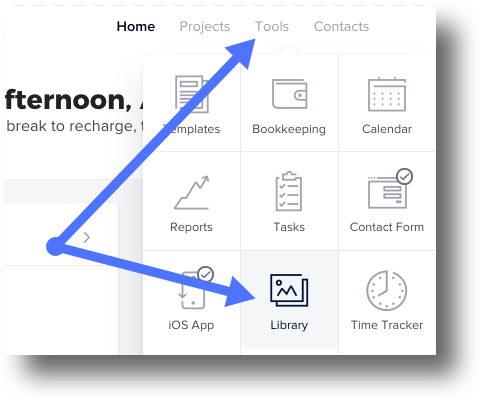 From your HoneyBook home page, click the Tools menu. 2. Select Library from the menu. 4. Follow the onscreen prompts to locate and upload the images or files you'll be importing. HoneyBook Tip: Ideal image dimensions will vary based on how you're intending to use them. For best results, follow the guidelines below. 5. Once the files have uploaded successfully, they'll be visible in the My Images or My Files, depending on the file type. Now, you'll be able to easily select images and files from your Library any time you're adjusting the imagery in a file or adding an attachment to an email with a client! 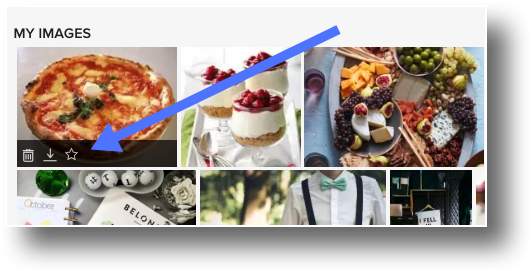 If you ever need to delete, re-download, or set an image as your default, simply hover over the image in your Library and select the trash can, down arrow, or star icon respectively. Can I email PDFs and images?